The Episode starts with Jagat talking to some man, who offers him a good deal. Jagat says I don’t want any illegal deals. The man assures profit for both of them. Omkar watches Shivika working in stress. She asks him if she can get leave. He asks are you fine. She says so sorry, its my first day today, its urgent, I have to go and get Shalu’s admission form. He says fine, maybe you kept a meeting with a client. She says yes, I will do the meeting and then go. He says I can get the form. She says no, I will manage. He says no, there is no problem. GST gets slapped by a girl. He says I will never help anyone now. Omkar calls GST and asks where are you. GST says I came to college to get form for Nisha. Omkar asks GST to get one more form. GST agrees and thinks for whom. Shivika and Omkar leave on his bike. He asks are you fine. She says yes, did I say anything wrong last night. Omkar laughs and says no, I got to know your weird wishes, you want to do love marriage, what did you mean to say. She gets down his bike. He falls down the bike. She runs to see. Shivika shouts Omkar. She says it happened because of me, I should have not got down the bike. She jumps in the lake to search for him. She cries and finds Omkar. She runs to him and hugs. She confesses her love while scolding him. He looks at her and smiles. He gets happy and says I love you a lot. She gets away and says this can’t happen. He asks is there any problem. She says yes, our caste. He asks caste in today’s times, you are educated, independent and you believe in these things. She says no, my dad believes in such things. He says I can understand this, but we will convince your dad, together. She says my dad will never agree, you understand why I maintained distance, my dad was Pujari in Banaras temple, children were afraid of love there. FB shows Shivika supporting her sister Payal in her love story. She didn’t know Payal will elope. Triloki argues with his brother. Shivika gets scared hearing them and gets angry on Payal’s eloping. Her uncle commits suicide and dies. FB shows Shivika apologizing to Triloki and telling him that she knew about Payal. Triloki scolds her a lot. She cries. He says one day Shivika will also run away. He gets a stroke and falls down. Everyone runs to him. FB ends. Shivika says dad feels I will also elope from home, we came here when he got a call to become in city temple. Omkar says its not your mistake. She says I know, I want to hear this from dad. He says you are repeating your mistake by hiding your love, keeping silence and eloping aren’t any solution, talk to your dad. She says Triloki will never accept anyone of other caste. He jokes. She says you think this is a joke. He says what else then, you should talk out, I will talk to him, who is your dad, I will convince him, I promise this marriage won’t happen without his blessing. She says marriage won’t happen, I have many responsibilities on my head, I don’t want to lose my dad, its no use to get love if it hurts others, you love me, I love you, matter ends here. She cries. She says we won’t talk about this, I hope you will try to understand me. She goes. Jagat and Mangal talk to Omkar. Shivika says I fell in love, Omkar is really good. She hugs Devki and cries. Triloki stays angry on Shivika. 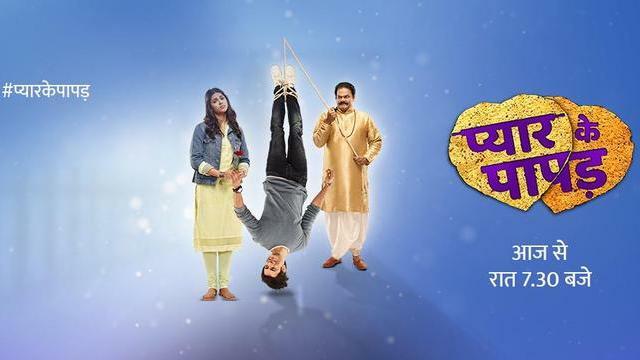 The post Pyaar Ke Papad 11th March 2019 Written Episode Update: Shivika confesses love to Omkar appeared first on Telly Updates.